Judge Robert Swanton (1767-1840), Ballydehob, West Cork presiding at New York Marine Court with Tipstaff Casey 1827. 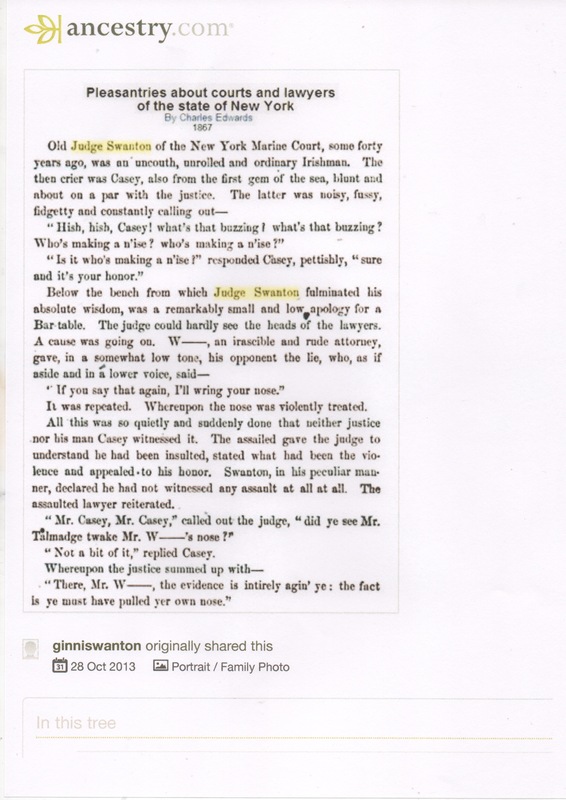 Judge Robert Swanton (1767-1840), Ballydehob, West Cork presiding at New York Marine Court with Tipstaff Casey 1827. Thanks to Ginnie Swanton. Some Cork Wills (1528-1859), destroyed in 1922 copied by William Henry Welply of Balineen, West Cork. Some Cork Wills (1528-1859), destroyed in 1922 copied by William Henry Welply of Ballineen, West Cork. The Welply’s are the McCarthy Mór’s who married Welply’s (a Dutch Man) daughter about 1700 and inherited his large estate in Cork City and Macroom. Welply had no sons and McCarthy assumed the name Welply. Welply was born in Ballineen 1866 and died in Belfast at the age of 90. He was a School Inspector and after Partition opted to serve out his time in Northern Ireland. The wills were copied pre 1922 most are now destroyed. The RCB Library in Rathgar in Dublin have some of his papers including many visits to Archives and Libraries in Ireland and the UK. This is taken from Dr. Albert Casey’s collection. In 1945 he was a member of the Cork Historical and Archaeological Society with an address in Greenisle, Co. Antrim. Harry Clarke windows St. Barrahanes Church, Castletownsend, West Cork with floor mosaics designed by Violet Martin. Died November 1829 Columbia, Doctor Thomas Foley, Physician to Czar and Surgeon General late Killarney. From Basil O’Connell newspaper extracts, Dr. Casey Collection, Vol 6 2103. There are many medical entries often abroad some with the British Military medical Service quite a number of Irish doctors abroad. Biographical data from Kerry Evening Post 1824-1864 and other papers including Cork details gleaned by O’Connell Brothers (Basil and Donal) in the 1950s. They were descendants of Daniel O’Connell and Basil wrote the O’Connell Tracts in conjunction with his brother a retired officer in the Royal Navy. They were from the Lakeview branch of the O’Connells outside Killarney. Cork Newspaper Extracts 1753-1771, 1782-4, collected by John T. Collins. John T. Collins, was a Cork Genealogist operating in the 1950s. He collected these from private collections including that of Mr. Cussen, Solicitor, Newcastle West, Co. Limerick. These were given to Basis O’Connell who at the time was writing the O’Connell Tracts. Basil in the 1950 was a retired Senior Police Officer who had worked in Malaysia and was a descendant of Daniel O’Connell. The tracts are the Genealogy of the extended family. Genealogy of Baldwin family from Salop. England 1580s Co. Cork, to Mossgrove /Garranconnig (Garran a’Chunaig), Mount Pleasant/Curravordy(Corra Mhor Dhuibhe), Lisnagat (Lois na gCat Cat’s Fort), Economic Resources Co Cork 17th century, Prices and Wages. Online history compiled by Terence Kermode, Suffolk, 2001, with some will extracts and deeds and some interesting comment on behaviour patterns. Colonel James Grove White (1852-1938), Historical Notes North East Cork precursor to Dr. Casey’s of Birmingham Alabama O’Kiev Coshe Mang. The notes cover the area around the family estates around Fermoy. They are an interesting mixture of history, archaelogy, ‘Seanachas’ amd genealogy. In compiling them he had access to family papers and the records of the Public Records Office destroyed in 1922. The records spill into other areas of Co. Cork. Dr Casey’s collections (15 volumes) cover the North West Cork/East Kerry areas and have some similarities. Grove White would have been a contemporary of Colonel Lunham, Robert Day, earlier figures such as Maziere Brady, Dr. John O’Donovan, Crofton Croker, Denny Lane, Dr. Richard Caulfield and later historians John T Collins, Paddy O’Keeffe, Bernard O’Regan, Father TJ Walsh.